"The sadness which has descended upon me as I have reached such an old age has been much sweetened by my success in avoiding the empty noise of blessings and honors. At the same time, the quiet blessing of true good friends is dear to me, so your honest words have brought me joy. Yours, Moshe Sharett. Sharett served as prime minister of Israel for about two years 1953-1955. Sharett's short term as prime minister was characterized by his weakness. 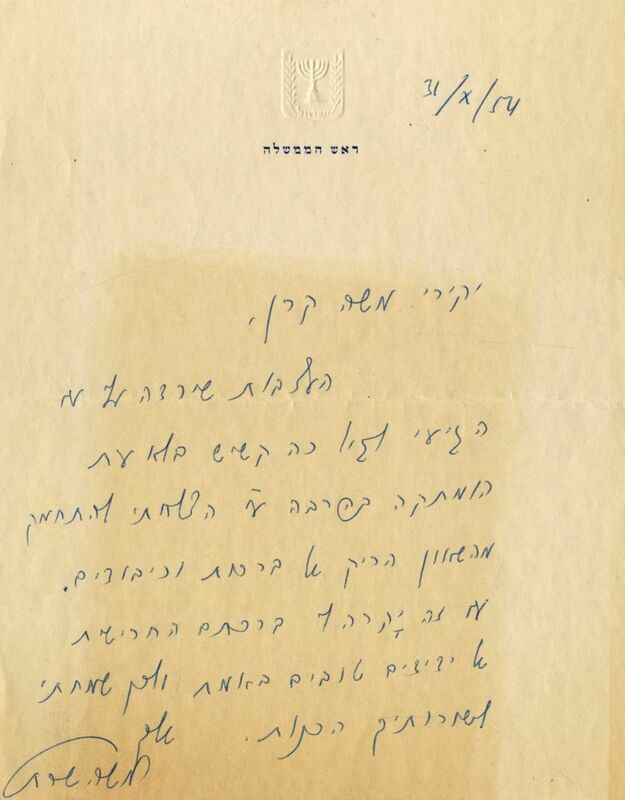 Ben-Gurion's influence was hard on him, and this remained unchanged even when he vacated his place as prime minister and settled in Sde Boker. Prime Minister Sharett's official leaf. 17x21 cm. Fold mark. Very fine condition.